Imagine you’re at a coffee shop, sipping on a latte while working on your laptop. After all that coffee, you need to run to the loo. Would you leave your laptop for just a sec while you heed nature’s call?Imagine you’re at a coffee shop, sipping on a latte while working on your laptop. After all that coffee, you need to run to the loo. Would you leave your laptop for just a sec while you heed nature’s call? Here’s another question: wouldn’t you hate it if your laptop disappeared? Your family photos, tax documents, and other personal stuff could vanish along with it. Unfortunately, it only takes a minor distraction for that to happen. And the last thing you’d want is for an identity thief to get their hands on your laptop. We’ve got some tips to help you protect your laptop — and the valuable stuff on it. Here’s a fresh take on our popular laptop security bookmark. Want to score brownie points at work, school, a local library, or anywhere in your community? Get free copies of this bookmark and pass ‘em out. Order as many as you’d like! Want more details? 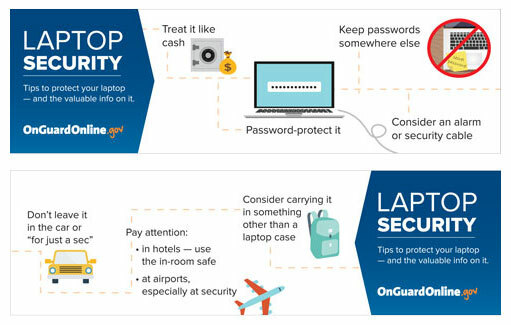 Check out this article to learn the do’s and don’ts of laptop security. Would you rather play a game than read an article? Play Mission: Laptop Security to test your skills at keeping your laptop safe. _________________ The Federal Trade Commission (FTC) is the nation’s consumer protection agency. The FTC works to prevent fraudulent, deceptive and unfair business practices in the marketplace.